There are some good dates which stick in your mind. You know the kind of thing - birthdays, wedding anniversaries, happy times. Then there are the others. Less good times. Much less good. Two dates are now etched into my memory for all the wrong reasons and I need to explain to you why that is. January 21st and June 6th 2010 are the two dates concerned. I've already written about the first date January 21st which is the last time we heard from Venus, our big, young satellite tagged female white-tailed eagle. She vanished from our lives on that cold winter's day in an area south of Oban. We kept hoping her satellite tag had maybe malfunctioned and would one day spring into life again. It never has. Her tag was working just fine up until that point and she had been very active and on the move in the days preceeding her satellite silence. Something else had caused her likely terminal demise. But I suspect we'll never know for sure. Last week I got the kind of email from Roy Dennis which I've come to dread. He regularly sends me all the latest data from our three remaining satellite tagged young sea eagles: Mara and Breagha from Loch Frisa in 2008 and Oran from Loch Scridain in 2009. The data for Mara and Breagha, now over two years old, was looking good. You can see it on the tracking map. Thankfully they're staying close to home. All was looking good. But then the words: "Sorry, no data for Oran". Your blood runs cold and you catch your breath. A few days before, Oran had taken off on a long, bold flight from here and headed to the northeast of Scotland. He was a young eagle with the wanderlust and this was nothing new. 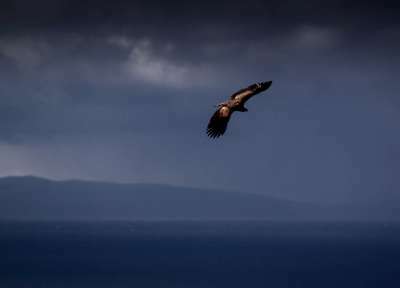 Since fledging less than a year ago he'd been to Northern Ireland, Islay, Jura, the Mull of Kintyre and back home several times. Doing what fit and healthy young sea eagles do naturally. We waited for the next satellite link up but the next email started to sound more ominous: "Still no data for Oran". And the next. And the next. Urgent calls to the US sat tag manufacturers confirmed, as with Venus, that our young male eagle had been alive and well, on the move and his tag working perfectly right up to that last lonely moment somewhere on a high heather moor on June 6th. We have heard nothing since and we can only surmise that Oran too has now become another casualty. Sure, he could have flown into power lines. He could have had a fatal encounter with another eagle. Perhaps he wasn't as well as we'd thought . But does a sickly eagle suddenly undertake a long arduous flight from his familiar homeland to new, unknown territory? Who knows. It's also possible something else caused him to fade from our radar. We will be doing all we can to find out. Venus was not with us for very long, just nine months. Oran at least managed to make it to his first birthday but was still gone less than a year from the date he fledged from his nest in the huge Sitka. Imagine the courage it took to launch himself from that nest! Some of you know that nest and what that will have involved. He always had the spirit of adventure and a feisty spirit. Take a look at the photos of him and Venus on the main tracking page to remind yourselves of what fine young eagles they were. 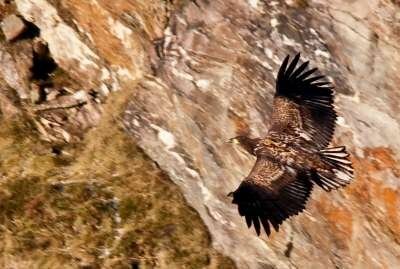 They've done their bit for science and helped us understand how and where young sea eagles like to explore. It's just tragic that it was all over so soon for them. January 21st and June 6th 2010: dates that will stick in my head now for all the worst reasons. Good news? Yes of course there is some! This week we satellite tagged two healthy, bouncing Mull sea eagle chicks from the Class of 2010. Stand by for their debut on the world stage once they fledge in a few weeks time. Mara and Breagha are doing just fine. If you want to remind yourself of their story go to the BBC Autumnwatch website, look for 'Meet the Animals'/'Stars of 2008' and view the three video diaries all about them. By now, as they enter their third year, they will be looking less and less like scruffy young sea eagles and will be starting to mature, day by day, into their adult plumage. Their beaks and eyes will be gradually lightening; there may even be early signs of some white in their tails. But you daren't allow yourself to look ahead too far or to hope for too much. Venus and Oran 2009-2010: we'll miss you. Dave Sexton. RSPB Scotland Mull Officer. 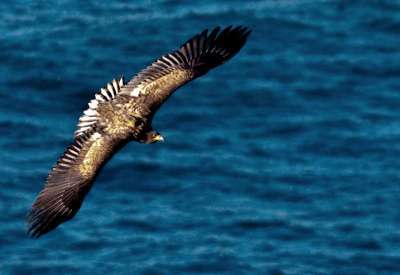 If anyone has any information on the missing sea eagles Venus and Oran, please send a message via this blog which will not be published and will be treated in strict confidence. This is such sad news. Not one, but two probable casualties. If they have gone, let's pray that their end was swift and painless. We at Friends of Red Kites in the North East of England have just heard that two of our red kites were poisoned - back in February, but the post-mortem results have only just come through. This is the third we have lost. On the whole we have had tremendous support from the core area, but Northumberland seems to be a less favourable county. 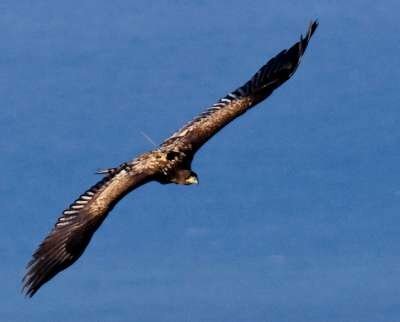 Let's hope your young eagles died a natural death; ours endured a slow, painful end. Dave, this is terrible news. Sorry to all the team who work so hard to get, and then keep, these eagles in the sky. so sorry to hear more sad news, hopefully its just a malfunction,, fingers crossed. last year i was luckily enough to see him and almost seen him fledge. Hi Dave can only guess at your hurt and torment,can only offer my sympathy along with all the others.Perhaps because we know almost certainly that these birds are lost the losses seem greater than just thinking they are out there somewhere which we may have done before tagging.What a pity Mull is not a lot bigger Island as most losses seem to occur once they go away. Oh, if only both tags prove to have malfunctioned..... Let us hope at least that someone, somewhere, will have news.